Being a supervisor of trainees is both a rewarding and challenging role, and any supervising clinicians acknowledge teaching to be one of the highlights of their professional career. On occasion, supervisors identify trainees who may not be meeting the standards expected, and not reaching their professional potential. Trainees may exhibit inadequacies in one or more of the areas of clinical knowledge, clinical skills or professional attitudes. The reasons for these inadequacies are often multiple. These trainees require remedial action from their supervisors, but many supervisors find managing this remediation difficult. Further, national authorities for training accreditation are clearly establishing their expectations of supervisors in these difficult situations. 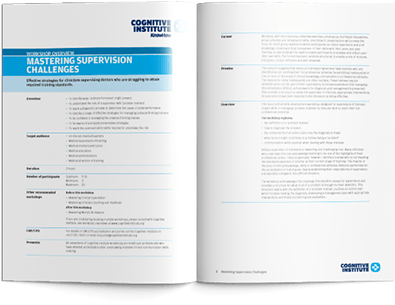 The Mastering Supervision Challenges workshop acknowledges the challenge this situation causes for supervisors and provides a framework for diagnosis and management. The workshop provides a practical structure for identifying and dealing with an underperforming trainee. It outlines an action plan which includes making the diagnosis, developing a management plan with appropriate interventions and finally monitoring and evaluation. apply the communication skills required to undertake this role. 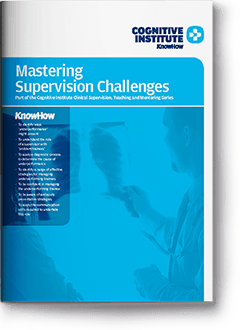 Effective strategies for clinicians supervising doctors who are struggling to attain required training standards.